Richard Esterbrook was a Cornish Quaker from England who studied business and opened a Stationers in England. He poured his profits into tin mining and eventually became so rich that retired to a farm. His son, however, sought to start a pen-making business with a family member. After a few not-so-successful attempts, they settled in Philadelphia in 1856. Unfortunately, Esterbrook's son began to suffer financially and he asked his father for help. Rather than simply offering his son money, he decided to come out of retirement and help, using his business savvy. 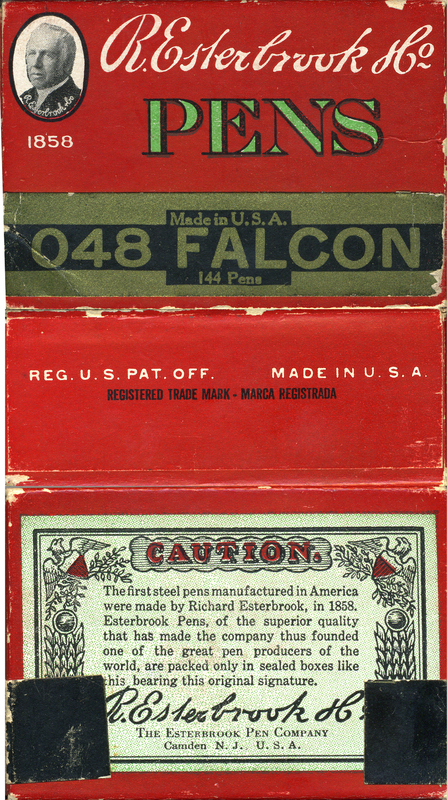 He acquired the assistance of three pen makers in Birmingham, England and uprooted to the USA.nbsp;In 1858 R.Esterbrook set up shop as 'The Steel Pen Manufacturing Company'&nbsp;where Richard and his pen experts made steel pens by hand using special tools and machines (mostly that had to be invented). In 1860 he dissovled the partnership and took over full control. Then he changed the company name to 'The Esterbrook Steel Pen Mfg. Co.' In 1866, the company closed its warehouse in Philadelphia and the company settled down in Camden, New Jersey. Quality was a key factor in his success. His steel pens were versatile, long lasting, and came in many different styles to fit the varied writing styles of the public. 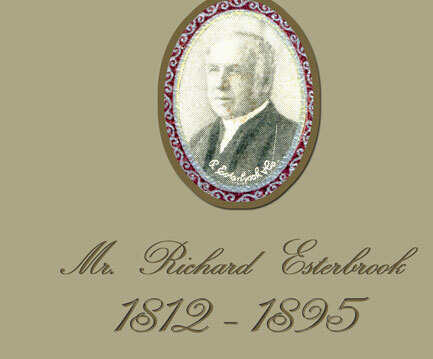 Sadly, Richard Esterbrook didn't see the 'empire' his company was to become as he passed away in Atlanta on October 12th 1895 . The company wasted no time after Richard's death to expand the company. Just one year after his death, in 1896 they started an Esterbrook branch in England to join the ranks of the other main pen manufactures in Birmingham . In 1912 the company had gotten so large that they erected a 5 story building, just to continue manufacturing pens. By 1920 the fountain pen was fast becoming more popular amongst people who were tired of 'dipping.' To meet this demand the company manufactured its first fountain pen. In 1930 the company sought less expensive means of manufacturing pens because gold and 'jewel' tips were too expensive and in this same year they began selling fountain pens in England . The Esterbrook Company began using the metal Iridium which they called 'Durachrome.' To meet the fountain pen demand the company reformed as 'The Esterbrook Hazel Pens Ltd.' In 1940 war had come to strike a blow at the Esterbrook company. On November 19th 1940 their England location was hit by an incendiary bomb destroying half of the location! To make matters worse, when putting out the fire using a human water bucket chain, someone accidentally grabbed a bucket of paraffin and set the place further ablaze. Oddly enough, the company was able to rebuild the structure during the war. However, the government had placed a stipulation that 50% of its capacity was to be used for government related purposes. 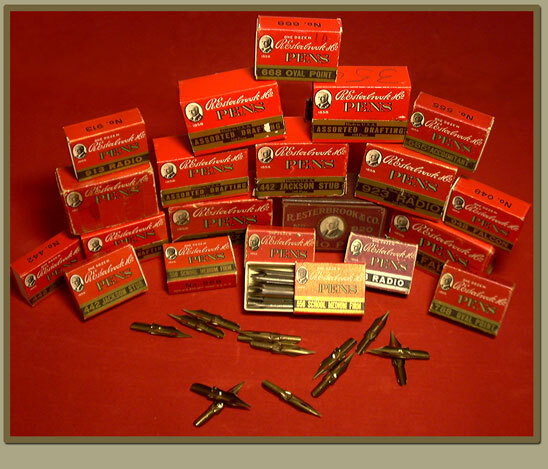 In 1947 the company bought out John Mitchell and the American branch had already acquired Hazel Pen co. The company re-formed again as 'The Esterbrook Pen Company.' Just as a personal note, this is the last company name the dip pen nibs were manufactured under. So that means some time after this the company ceased production of dip pen nibs permanently. They had also started decreasing the quality of the dip pens in almost every area including construction, and materials. Be that as it may, the company continued to thrive until the beginning of 1960 when the company started to see a decline in export trades with England . In 1967 the Esterbrook Empire was bought out world wide by the Venus Pencil Company and thus the name changed to Venus Esterbrook. 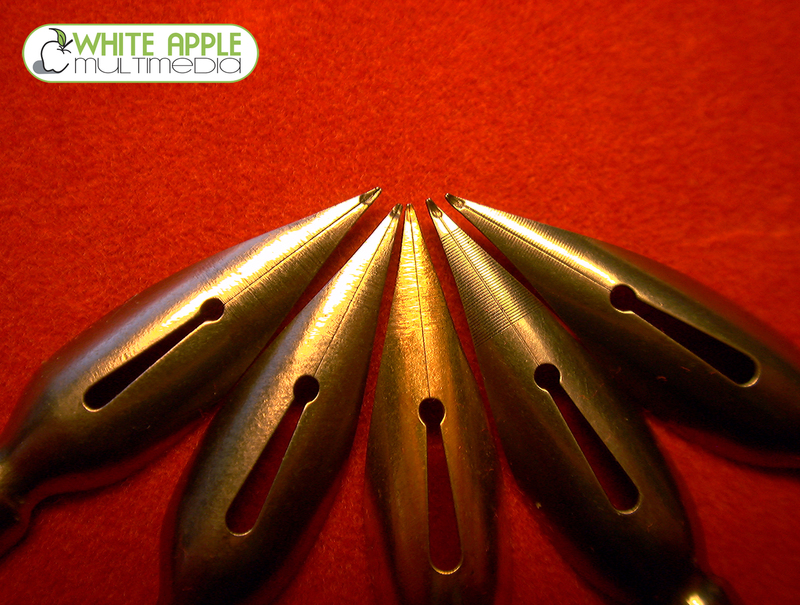 Venus Esterbrook continued to produce the renew points for fountain pens. There were numerous administrative changes and moves and eventually their final base of operations was vacated in 1972, though the building still stands today. The end of the empire was gone, for now. The company, in one fraction or another can be traced through Berol Ltd. from 1995 to 2015. Finally, at last, Kenro Industries acquired the rights to the Esterbrook brand and are keeping them alive with the release of a new Esterbrook Fountain pen called the "Estie." 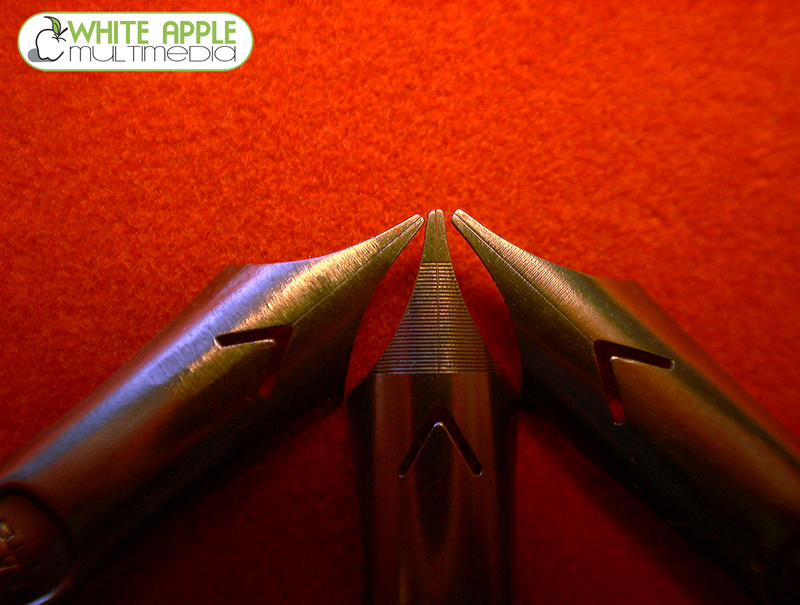 White Apple Multimedia Production: "Esterbrook, A Dip Pen Legacy"
In my book I cover the company history in far more detail. Such as, who were the prsiding presidents after Esterbrook's death. 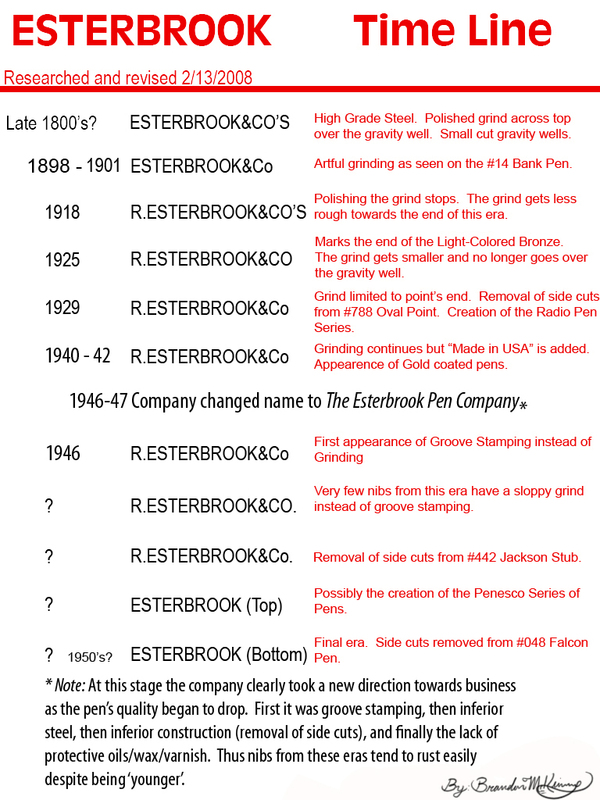 Details about Esterbrook's pens and their various features. It also includes an incredible dating system, fine tuned with over a decade of research and collecting. It has nearly 200 high definition photos. It is a historic reference book that will guide you through Esterbrook's incredible world of dip pens. Below you will find the archivial "History"data that was previously posted on my website since 2008. It is a small snippit of the information you will find in my book. ESTERBROOK&Co, ESTERBROOK&CO'S, R.ESTERBROOK&CO'S, R.ESTERBROOK&CO, R.ESTERBROOK&Co, R.ESTERBROOK&CO., R.ESTERBROOK&Co., and just plain old ESTERBROOK (At the top, then at the bottom). I have personally been collecting these pens for over a year now and I know there is still much to learn. If you feel you have information to share or significant findings I have not listed, please share them with me. I would be ever so appreciative. You can email me here: brandon.mckinney@whiteapplemultimedia.com. I also wish to state that I am always on the look out for new nibs to add to my collection or research. 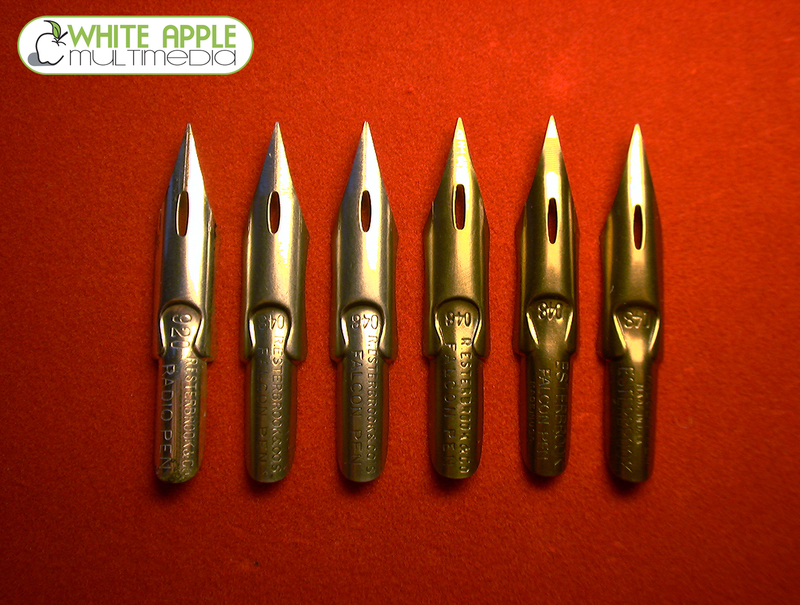 So you are looking to rid yourself of any Esterbrook nibs, please feel free to offer them to me ^__^. I will pay a fair price for them. 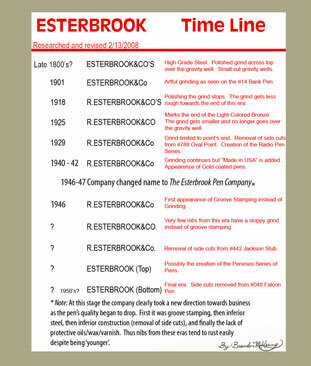 In fact I am currently looking for any boxes of Esterbrook that are from their " Philadelphia " period. These boxes are brightly colored with painted flowers or patterns. DATING THE ESTERBROOK DIP PENS!!!! 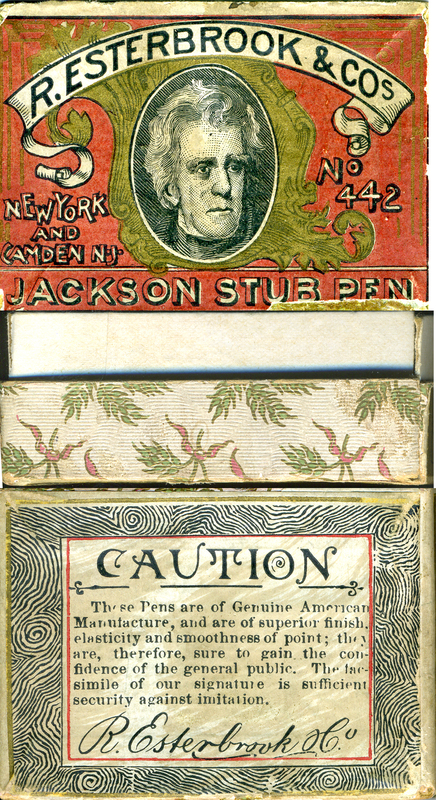 Directly above you can see 4 of the different styles of “caution” Esterbrook used on their boxes. You will notice differences in Company signature, color, as well as company name. You will also notice that the text in the caution also changes. I selected these 4 because they show the most variance and I feel significantly define an era. You can click on each one to see it with more detail including the sides and tops of the respective boxes. To your right you will see 2 documents that accompanied nibs as far back as 1940 (that I know of). These are the Warranty or Unconditional Guarantee card. These documents are the first signs of purposeful dating by the Esterbrook Company. The Date is featured in the lower right corner. You can click on either of these documents to see a more detail picture. Please click the image to view the document in more detail. To your left is a more thorough box comparison. It illustrates the differences in design, and packaging. These factors help determine the age of the box and comprises at least 1/3 of my over all age verification theories. 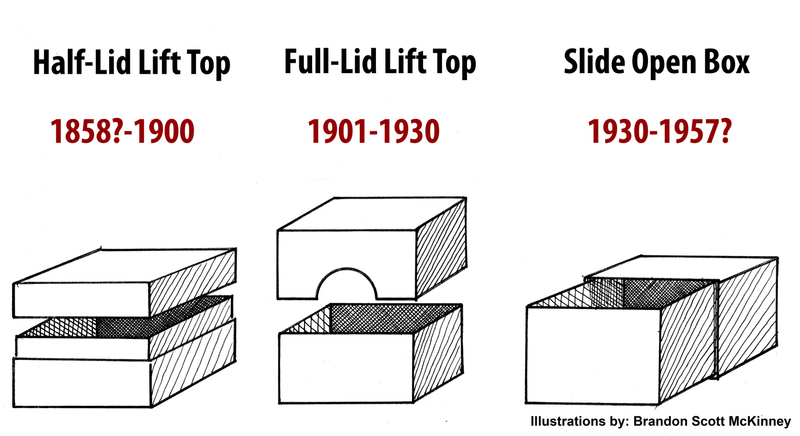 Please take note that box type goes from a half-top lift box to a full-top lift box and then into the now familiar slide open box. 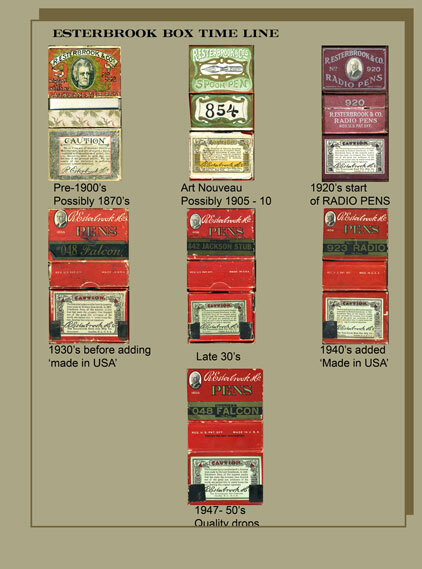 Also note that the boxes begin listing that they are registered in the Patent office. At the very end of the line they started making this statement in Spanish. Esterbrook was Bilingual before it was popular ;). Therefore, if you find yourself with a box of Esterbrook dip pens and you want to know what year it might have been made, use these techniques to discover its general era. My theories, while still theoretical, are based on logical evidence. Such as advertisements and how the point was handled (grind vs groove as seen later in this discussion) as well as company name variation. I feel confident that the age is correct within 5 years. If you visit my collection page you will see a few more Esterbrook artifacts. One is of a pamphlet I obtained in an Esterbrook Tin that stated they were around “20 – Odd years” which translates to 40 years. Because they officially started in 1858, that would place that tin and its contents to the year 1898. 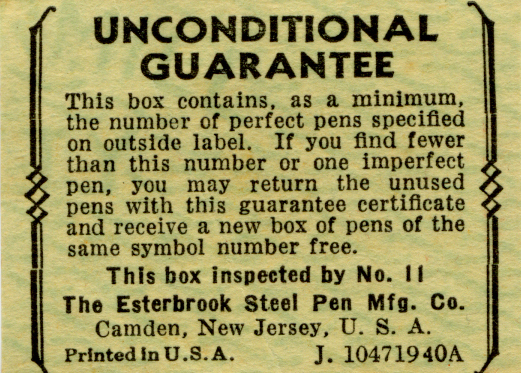 Because the nibs were stamped ESTERBROOK&Co it means that any nib stamped with that particular company name could be before 1900. I have also seen an advertisement from 1901 with that company stamp as well. 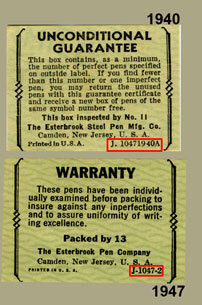 So therefore ESTERBROOK&Co is used between 1898 and 1901 verified. Feel free to click on the images below to read through the pamphlets. 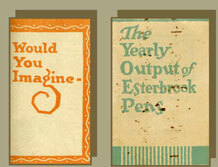 Above are 2 old pamphlets that outline various trivia about Esterbrook pens and their manufacturing process. A lot of useful information is held within. Such as that it takes 19 distinct processes to make just 1 pen! Also it takes 1 month to make 1 pen. It definitely outlines Esterbrook's quality. I have personally seen their pens to be consistent in quality surpassing if not being equal to their competition. Sometimes very interesting information can be found with the boxes. For example the oldest box I have is the 442 Jackson Stub shown in the document above. It has an illustration of Andrew Jackson the 7 th president of the United States of America from years 1829-1837. This is significant as it tells us that the ever-popular Jackson Stub was clearly named for President Andrew Jackson. Unfortunately, there is no explanation as to why. Considering that President Jackson died in 1845 and Richard Esterbrook didn't arrive in the states until 1856, there is no correlation to be drawn. Although I didn't do any extensive research on Andrew Jackson, it is possible that he preferred stub-styled pens. Here is a link to Wikipedia's information regarding President Andrew Jackson. Another bit of interest on this same box, are the designs used to adorn the outside. Its not quite Art Nouveau in style which is roughly from 1880 – 1905. So I would place this box just before 1880. I would most likely put this box between 1870 – 1880. It could actually be older. Also the company stamp used for the nibs in this box was ESTERBROOK&CO'S. The steel is almost platinum in color and the grind is very carefully polished. It's very similar to early grinds from the ESTERBROOK&Co period, which we know are from 1898 – 1901. 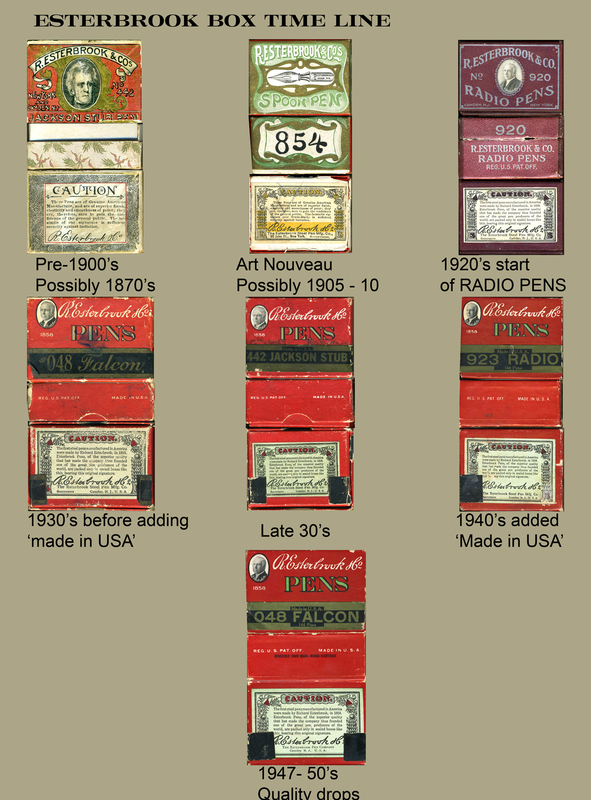 I have further compared this nib to other 442 Jackson Stubs from other old boxes as well as cross referenced to other nibs from similar eras. All this evidence together helps me make an educated guess on age. Finally we get to a more personal dating system. It would seem that sometime early on it was discovered that you get a more flexible tip by shaving/carving off some of the steel at just before the tip of the nib in addition to cutting slits into the sides of the nib. This was termed 'Ground-Point.' 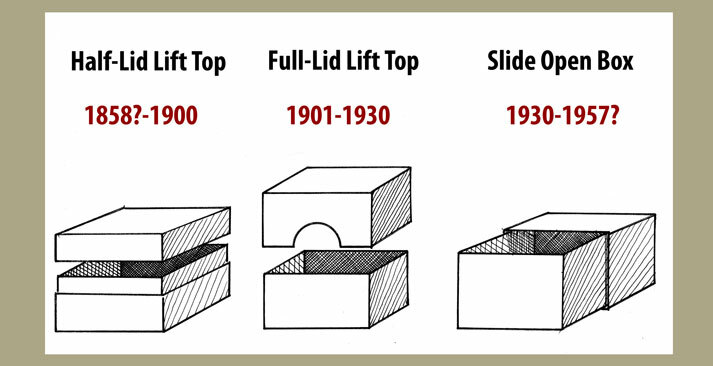 Sometime just after 1930 they determined it was cheaper just to stamp grooves instead of grinding. This became known as 'Groove-Point.' Now I have personally discovered that there are 2 different types of 'Grinding' and 'Grooving' that has occurred. The first type of 'grinding' was artful in nature. It was done in 2 steps. Step 1 was a vertical rough grind called “Straight Grinding.” It appeared as vertical lines just behind the gravity well. Step 2 was called “Cross-Grinding.” Here they made heavy cuts vertically over the gravity well and just up to the point (the actual point remained untouched for stability). Then they horizontally ground across to make a very polished look. The end result was very fashionable. 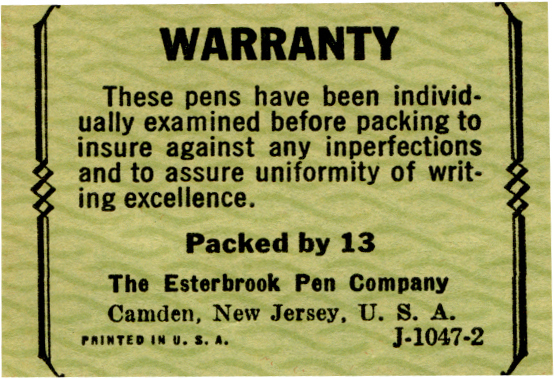 For example this technique can be seen on the earliest Esterbrook #14 Bank pens, #333 Extra Fine Pens, and even #354 Medium School pens. 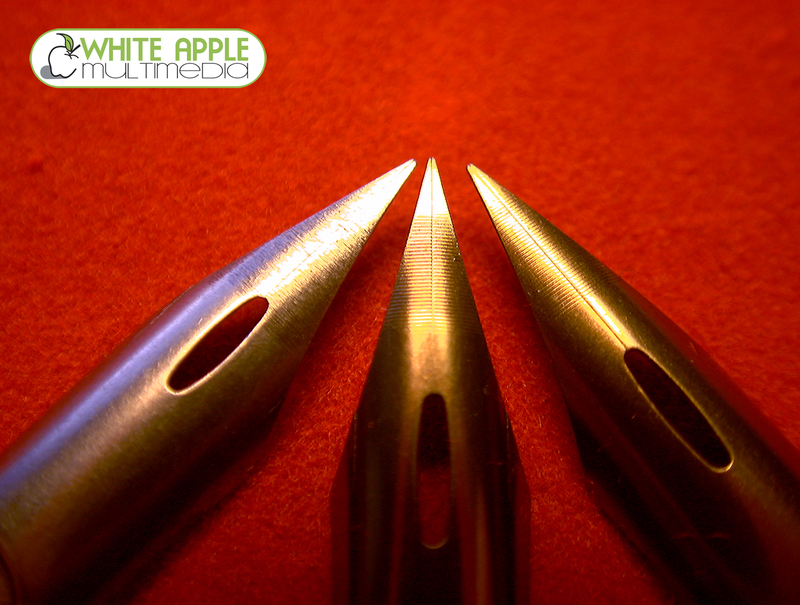 A more common nib with this feature is the popular Joseph & Gillott's #303 Extra Fine pen. The effect, when reflected in light, is a very interesting pattern. Some companies even made interesting shapes out of the gravity feed and then accented those shapes with clever, skillful grinds. A great example of this is the famous Joseph & Gillott's Principality nib. Arguably the most sought after nib in the world. Although, I have yet to see such practices done on an Esterbrook nibs. Later on they clearly wanted to save time and money on grinding by simply grinding across once horizontally rather than spending the time to make it look “polished”. I have seen these grind spots get smaller and smaller, and less carefully placed. Obviously, the final stage to save time and money was to simply 'STAMP' grooves along the upper tip. In consequence the grinder was 'fired.' Very few companies still maintained a 'grinder' and even advertised that they were still hand ground. Eventually all companies succumbed to this practice as the fountain pen took over completely. Honestly, after much testing I have found that if the groove pointing was done with great care and skill it can almost match the hand-ground tips. In fact I have really only witnessed this in the Esterbrook's RADIO PEN series. This is understandable considering these were their ‘special edition' nibs and were more expensive. To better illustrate this discussion, please click on any of the 4 images above to see a detail of Groove vs Ground point. :) The points shown are the 048 Falcon, 788 Oval Point, and the 442 Jackson Stub. Below are 2 charts that I made illustrating points there were made earlier in this discussion; such as box type and company stamp. This information is constantly changing as soon as new evidence is obtained. So please, if you feel I have made an error and/or you have additional data to provide I would be very happy to hear from you. Click to send an email. Please note that I have not included tins and the purple boxes in the box types as these were obviously “special edition” and not very common. Also, as of this writing I am awaiting an old Philadelphia box of nibs and will include any new data I derive from it. Please click on either image to view in more detail. The 'Naming Convention Chart' shown above covers all the various company names of Esterbrook stamped on the nibs that I have encountered. To the right of each name variation is a brief 'trivia' fact in regards to the specific stamped names. If anything this is one of the most accurate forms of dating these particular nibs. I have found that this option isn't the best method for Spencerian and many other different brands (as they didn't change much over the decades.) However, it does work for Hunt. There is no mention as to why there needed to be such variation in company name over the years. It is possibly because they wanted to make their nibs appear ‘new' or maybe it was to stay “in style.” Another theory is that maybe the stamps used might have broken and every re-order was different because communication would have been poor in those days. However, its really anyone's guess ;). They probably didn't expect anyone to notice or care.